San Salvador (Agenzia Fides) - Two marches took place yesterday morning on the streets of the capital of El Salvador, both of them headed towards the Legislative Assembly to ask deputies to approve a general law on water and amend article 2 of the Constitution to recognize the human right to water. 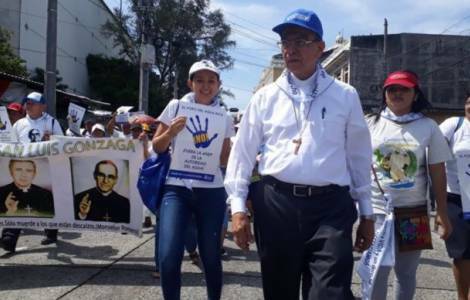 A march began from the University of El Salvador, led by Rector Roger Arias, followed by dozens of students and employees of the institution. The other was convened by a coordination represented by the Catholic Church and historical churches, organizations for the defense of human rights to water and the Central American University José Simeón Cañas (UCA). The "mega march for the defense of water" brought a proposal, according to what we read in the note sent to Agenzia Fides: the request that deputies resume the discussion on the 92 articles of the general law on water, already examined by the previous government (2015-2018). A group of participants in the march, belonging to religious and social organizations, submitted a document with 200,000 signatures to the deputies asking them not to privatize water and approve a legislation on the matter. This group left from the square in front of the Metropolitan Cathedral, where the Archbishop of San Salvador, Mgr. José Luis Escobar Alas, explained the purpose of the mobilization, accompanied by Cardinal Gregorio Rosa Chávez. "For over a decade the people have called for the urgent approval of a general law on water", said Mgr. Escobar Alas.